As well as his healing thumb injury. You've more than likely seen Aaron Gwin teasing a new downhill bike on social media. 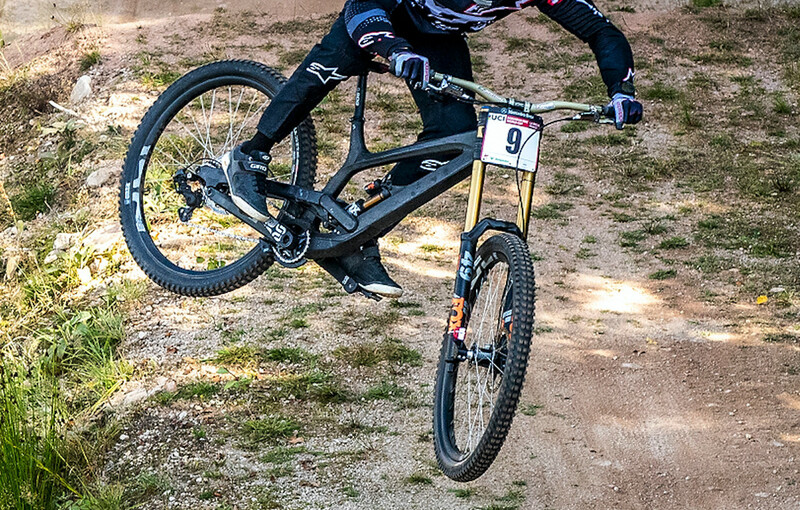 Now, he's back racing in La Bresse with the secret machine and has confirmed the YT DH bike is a 29er. He's been on the new whip for a couple weeks riding in California and said that between the 27.5 YT TUES and this 29er version, he prefers the 29er. Though he hasn't had a lot of time on the bike, specifically on rough tracks, it sounds like he's committed to the big wheels. His thumb injury is healing, he's able to hold on and while he's implying a conservative run this weekend in La Bresse, his focus is on World Champs in Lenzerheide two weeks from now. 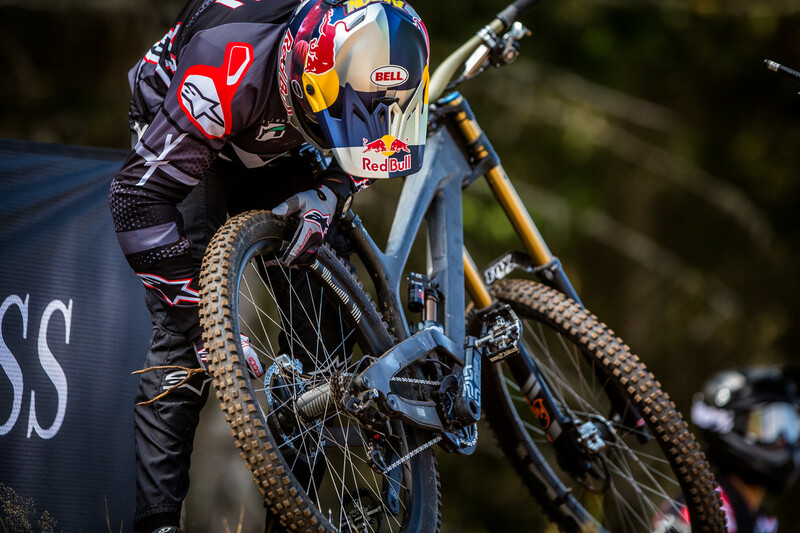 He has yet to win a World Champs DH title. but then this just showed up. So what tires is Gwin gonna ride? Well that just happened to work out well for Gwin getting new 29" rubber from Onza. I guess when you're gold status like Gwin, the wheels spin a little faster to get what you need to be #1. At one time there was still 26" bikes winning world cups... Things take a while to really catch on in the bike world. I'd bet money that after a few more companies release proper long travel 29ers (hopefully by next year) and get their racers on them for a majority of the season, the top 20 EWS will be stacked full of them. Sam does count and 100% could pick the Mega 290. He picks the 275.
so that's 40% 29er with at least 2 riders deciding to go with 27.5" wheels when they had 100% viable 29" wheeled options. Sam Hill doesn't count because he is the epitome of adversity to change (aka old school). The guy still races on flats and would still ride 26" wheels if he was able (and probably still win on them). Canyon doesn't have a long travel 29er option (yet) and I don't think its fair to say that GT does either, the Sensor is not what most would consider an enduro race bike. Even if you set it to 140 it not comparable to bikes like the SB 5.5 or Ripmo. And wait until Yeti releases their new long travel 29er, I bet we will see Rude spend a good bit of time on one and if he does I'm eager to see the results. I agree with "different strokes for different folks", but I think a top-level racer will prioritize what they ride based on two things: what their sponsors pay them to ride and more importantly what goes fastest. Granted what wheel size goes fastest can vary from track to track and rider to rider, I think most pros will be faster on 29ers on most tracks. Look at the increase in results when riders like Eddie or Robin gave the big wheels a try. I'm not saying you can judge a whole field on a couple riders, but I think as more racers give the big wheels a try, we will see a large swing in what wheel size dominates the top rankings. Eddie almost won EWS Rotorua on a 27.5 bike had it not been for a bizarre mechanical issue, so I don't think he's a great example. Fact is no one's results have actually increased over their expected results - guys like Luca Shaw moving onto Syndicate are expected to do well already, Jack Moir was already onto good results on the M16 last year before getting on the M29. Fact is Gwin on 27.5 and Minnaar on 29 are where they always have been, Bruni and Brosnan are still winning, and guys like Greenland and MacDonald are on bumper years on 27.5. While fairly new in DH, 29" has been a viable option in EWS almost since the start, yet the top 20 are still 27.5. For a change that Commencal reported was '7 seconds faster' there is still no evidence 29" wheels is an advantage at the highest level of the sport. "Granted what wheel size goes fastest can vary from track to track and rider to rider, I think most pros will be faster on 29ers on most tracks. " We are really saying the same thing. As nickb01 points out below however, plenty of guys have gone back to 27.5" in DH. I've raced both 27.5" and 29" this year. I'm faster on 29" but its marginal, at best. Put another way, I'll pick the bike with the better geometry, better quality of travel - hell even the one I have better tires for before I pick wheel size. I prefer a 27.5 for my riding and short stature, but having ridden both, 29ers are faster. I'm shocked it's taken some racers this long. Mont Saint Anne is super fast, rough and technical. Yes a 29er won it, but 27.5 was in close 2nd and 3rd spots. 29" just doesn't work for smaller guys like Brosnan and Danny (and Greenland). But we knew this from the beginning right? It's not the end of 27.5". I thought Loic won on 27.5" wheels? Cool! I stand corrected! Thought he was on 29" after all the memes going round. I think I'm getting mixed up with the 29" trail bike thing back at Leogang. 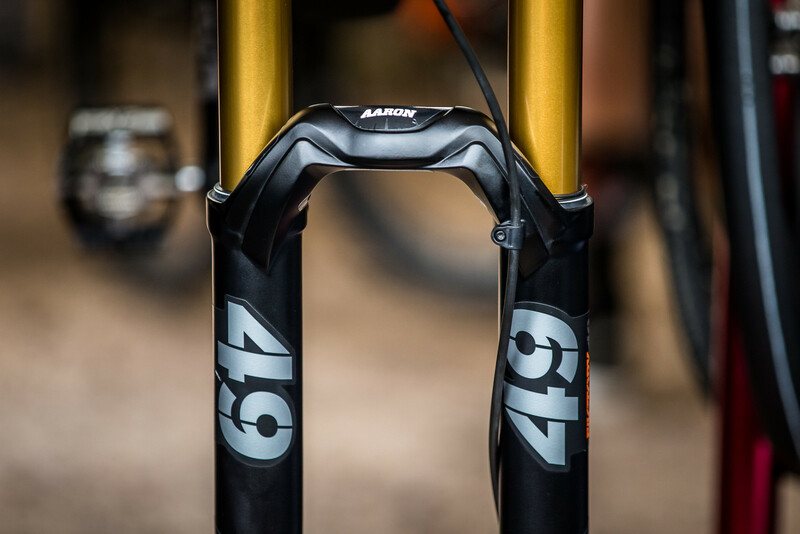 Bruni's on a 27.5 bike for now. After getting spanked by his younger compatriote on a 29er, we'll see what he's riding next season. Anyways, a fast guy can win on either wheel size. No doubt. But I still think they will all (regardless of size) be on 29ers in the next couple of years. Oh man did we ever......I haven’t even upgraded to a 27.5 full suss yet(I have a 27.5 hardtail), and I’m already worried they’re gonna go away. I just like my smaller wheels ok? the frame looks super raw and definitely has a prototype look to it. Is that an asset/id tag on the head tube?